With a definite Best Actor Oscar nomination for Michael Fassbender, Best Supporting actress nomination for Kate Winslet and probable nominations for screenwriter Aaron Sorkin and director Danny Boyle along with Jeff Daniels and/or Seth Rogen for Best Supporting Actor I wish I could say “Steve Jobs” is a ‘must see’ movie but the most I can say is the fast smart dialogue while walking fast, a trademark of Sorkin’s, along with director Boyle’s kinetic use of the camera, aided by the soundtrack of Daniel Pemberton, add up to an interesting movie. Sorkin has written a 3 act screenplay, each act revolving around a creation by Jobs such as the Apple II, the NeXT and the iMac computers, while Doyle films the first act in 16mm film, the second in 35mm and digital for the third act. It is generally known and accepted that Steve Jobs was a cold, dictating boss who never gave credit to anyone keeping it all for himself, gave more love to his technological creations than to any human being, never treated anyone around him fairly, was an impossible perfectionist, always composed, cool and in charge, comparing himself to G-d, Julius Caesar and seen as a bully but even those who hated him acknowledged him as a visionary. The fact that he was adopted and given back after a month to be adopted again, being brought up as a Catholic, refused to acknowledge the birth of his own daughter until she was in her teens and his long time, non-sexual, working relationship with Joanna Hoffman (Winslet) who was one of the few who could and did stand up to him, are never dealt with in depth which may have helped explaining the man himself. We learn little about the man himself which is a big failure of the film. There is no faulting of the actors from the three, Makenzie Moss, Ripley Sobo and Perla Haney-Jardine who play the daughter at different stages, Katherine Waterston who plays the mother, Mac collaborator Andy Hertzfeld, played by Michael Stuhlbarg, to all the supporting and bit players. Daniels takes his character from “The Newsroom” a step higher! 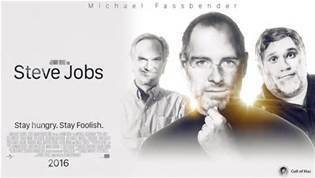 Fassbender IS Steve Jobs even though he may not look like him to start with eventually he is the man you have seen on large stages introducing his products. He handles the pacing of Sorkin’s words and Doyle’s camera along with the anger he feels not knowing how to deal with feelings. The relationship between Winslet and Fassbender though her loyalty to him and why he would listen to her and not others is never explained but because of the actors you accept that it is just what it appears. For excellent acting, snappy, sharp dialogue and above average unobtrusive directing plus award conversations “Steve Jobs” is a film to see.